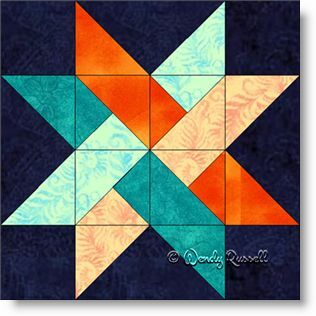 The Woven Star quilt block is technically a four patch block because it is built on a 4 x 4 grid. But in this case, it is constructed as an uneven nine patch due to the use of the flying geese patches. This is an easy quilt block to sew, but it does have an interesting (and underused -- at least in my opinion) patch, called the three quarter square triangle patch. (Look closely and you will see that there are three right-angled triangles that make up the patch.) This patch allows for the optical illusion of the woven effect in this block. And I chose a dark background fabric to extend the idea of a twinkling star in the night sky. The two sample quilts illustrated are both set on point but give you ideas that there is a great variety of settings you can create with this type of quilt layout.